Do you enjoy gardening; want to be much closer to nature or just want to keep your backyard plants watered? Vivibel expandable water hose set will be helpful in all your garden watering tasks. extra-flexible 3750D polyester fabric cover protects the double latex inner tube-no need to buy garden hoses every season. automatically return to its original size once empty. showering your dog and washing car - just choose right type of stream & your watering task will be easily solved. (more convenient to turn on/off the water, avoid countless trips to the faucet and save water bill), the free storage bag helps you to save a space. 【HIGH QUALITY GARDEN HOSE 】:We adopted solid 3/4 Inches brass connectors, rubber washer, double latex pipe, sturdy on/off valve, zinc alloy spray nozzle, extra-flexible 3750D polyester fabric cover. Just to make sure there is No more leaks, tear or cracks. 【FLEXIBLE NEVER TWIST DESIGN 】: The new design expandable water hose never tangles, twists or kinks. 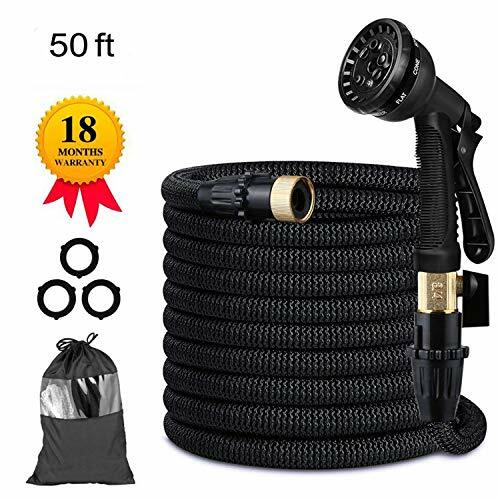 Expandable hose starts out from 17 Feet; when the water is turned on the hose quickly expands up to 3 times in length (50 Feet) with the water pressure (3-12 Bar) and returns in minutes to its original length when the water is out. The hose can withstand water pressure 3-12 Bar and temperature 41℉-113℉. 【FREE 8 PATTERN HOSE NOZZLE】:The sprayer boasts non-slip and comfortable grip and rotating bezel for choosing 8 spray patterns. Great for house/car/floor/yard washing, garden watering, pet cleaning, having fun or business use. 【EASY TO STORE 】:Retractable, lightweight, highly portable, flexible hose comes with a free storage bag - simple way to save your storage space. Just drain water from the hose when not in use, put in the bag and store out of direct sun. 【SATISFIED WARANTEE】:The garden hose set comes with 3 free rubber gaskets in case for need. Our expanding washing water hose have 18 months replacement warranty and 100% satisfaction guarantee, please feel free to contact us if you have any problems, we will help you in 24 hours. If you have any questions about this product by Candywe, contact us by completing and submitting the form below. If you are looking for a specif part number, please include it with your message.